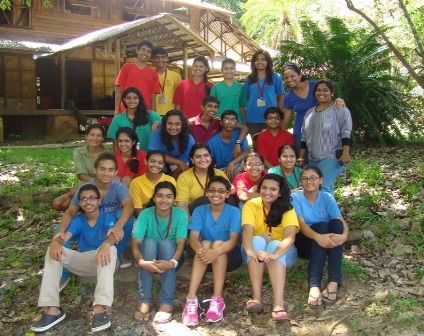 Last month, 21 students from 9th and 10th grade got the wonderful opportunity to visit the Andaman and Nicobar Islands. I was lucky to be part of that group. Before we left I was scared because I thought that I would see a lot of bugs and the living conditions would be horrible, but it wasn’t like that at all. We left on 25th April. Before we landed in the Andamans, we made a one-day stop in Chennai at Madras Crocodile Bank Trust (MCBT). We did many things there. One very unique experience that I had was cleaning a crocodile pit. The water was very dirty as it hadn’t been changed in 4 months. It was kind of scary, because we were cleaning the pit and there was a 15 foot crocodile sitting and watching from 20 feet away. We also got to hold a rock python and a baby crocodile. The instructor, Gayatri Di also took us on a tour of the park by day and at night. The next day we took a flight to Port Blair. After a short bus ride, we arrived at the Andaman and Nicobar Environmental Team (ANET) base in Wandoor. We were greeted by 2 instructors, Smita Di and Tasneem Di. Later that day, we went on a treasure hunt (in the rain!) to familiarize ourselves with the ANET campus. That evening, we were divided into 3 groups. Each group would do all of the 3 activities, but on different days. On the second day at ANET, my group went scuba diving. First we went to a pool and got used to breathing with a regulator underwater. Then we went to the diving site. It was about half an hour away from the shore. There were 3 divers – Umeed Sir, Leon Sir and Tasneem Di. Each diver went with one student at a time and we stayed underwater for about half an hour. The underwater world was amazing. There were fish of every color imaginable and brightly colored coral reefs. It was like another world that I never knew existed before and it was so quiet that I could hear myself breathe. It was a wonderful experience to see and feel things like fish, starfish and corals in their natural habitat. On the following day, my group went on the mangrove walk. Smita Di came with us. First, she told us to observe the plants and animals around us and describe them. I saw tadpole-like creatures hopping around called mudskippers. I also saw these crabs with one big red claw called fiddler crabs. They had made holes in the ground and they would all scurry into their holes when someone came near them. The mangroves had waxy tear-shaped leaves and arch-shaped roots above the ground. We continued walking through the marshy area till we reached the beach. There we saw a starfish that was lying upside down. Over time, it turned itself over even though it didn’t have any tissues. Our third activity was the inter tidal walk. We had to leave very early because the low tide was at 5am that day. On the way to the beach we went bird watching. Tasneem Di pointed out some birds like the kingfisher, myna, heron, red collared dove and asian glossy black starling. It was bright and sunny when we reached the beach (the sun rose around 4:30am and set around 5:30pm). Our instructor for that walk was Sahir Sir. The intertidal zone is the area between the low tide line and the high tide line. We walked through the shallow water and saw an oar-footed crab, sea cucumber and cabbage seaweed. Eventually we turned around to head back, and this time we walked on the beach. On the beach we saw spider crabs, gastropods, sea sponges, a guitar fish, a box crab, and sand dollars. Then we went back to ANET. At about 12 noon we left for a forest walk. It was raining and the path was very steep. Most of us were slipping and sliding all over the place. That walk was about two hours long. After lunch we were divided into 2 groups. One went to interview a fisherman and the other went to interview a farmer. I was in the farmer’s group. The farmer’s name was Mr. Mukundo Mandal. He was 78 years old and had come from Bangladesh. It was very interesting to hear his story. The next day we went to Port Blair. First we saw Ross Island. It was the British headquarters before independence. There were many old buildings like the printing press, water distillation plant, and subordinate’s club with no roofs and vines growing all over the walls. There were also many deer randomly strolling around. After that we visited the Anthropological Museum. There we saw many artifacts that had to do with the history of the Andaman and Nicobar islands. There were vessels, jewelry, hats, etc. that were used by the tribals. The umbrellas and anklets were especially pretty. Then we went to eat at a buffet restaurant with a lovely view. After lunch, our next stop was the Cellular Jail. This was where the Indian prisoners (freedom fighters) were held during the British rule. The jail was made on an island because it was surrounded by water and so nobody could escape. It was in the shape of a tower in the middle and 7 spokes around it and each spoke had 3 floors of cells, so if a guard was stationed in the middle tower, he could see all seven halls from one place. Today there are only 3 spokes standing. The view from the top was breathtaking. On our final day at ANET, we went for a beach cleanup in the evening. By the time we got to the beach, a steady drizzle was falling, but that didn’t stop us from running into the water! We weren’t allowed to dip for long because Smita Di came and gave us all canvas trash bags. Our instructions were to pick up all the trash that the high tide had washed onto the beach. It was sad to see how many plastic wrappers and bottles there were. Animals can mistake the plastic garbage for food, eat it, and then they will die. After we were done, we were allowed to go in the wonderfully warm water again. Then we saw the most beautiful sunset that I have ever seen. Sadly, we had to leave the next day. We reached Pune late in the night. I will never forget this trip ever in my life. It was an awesome experience and it taught me how to stay away from home. I would really advise anyone who is looking for a beautiful and adventurous trip to go to Andaman!